It is my pleasure to present you with the second issue of VTS Mobile World in 2019 – your IEEE Vehicular Technology Society newsletter. In the issue, the President outlines the Society’s action on promoting diversity and inclusion and the formation of the VTS Ad Hoc Committee on Women and Diversity. VTS Vice President—Mobile Radio also provides a summary of VTS activities in mobile radio. Each year, VTS recognizes individuals’ achievements and technical contributions with a range of technical and service awards. The Chair of the VTS Awards Committee presents an open call for nominations for the 2019 Vehicular Technology Society awards. Regular technical columns, a review of a selected paper from the IEEE Vehicular Technology Magazine, as well as news from the VTS Resource Center and VTS-sponsored conferences, and a series of calls for papers, also complement this issue. I hope these articles are useful for you and that you will enjoy reading them. 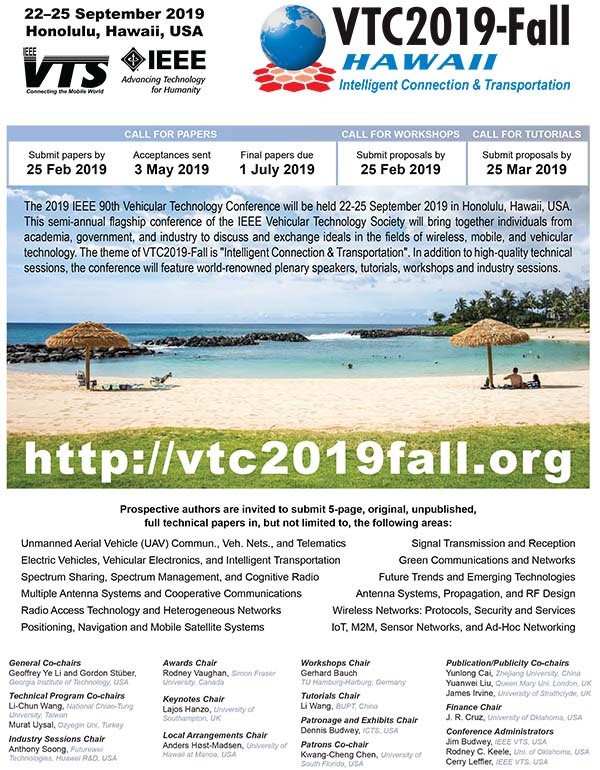 As always, I look forward to receiving your feedback on how we are doing, and how we can better serve all VTS members in future.You can contact me directly by email at a.jamalipour@ieee.org.